When you thought it was safe to read this blog again . . . the Jamón Conspiracy pulls you back in. Here is a very funny Apple parody, in Spanish, called iJam. Not only is it funny, it also reflects Spaniards’ fixation and obsession with Jamón — a dried pig leg. Regardless of how exquisite Spaniards may claim it is, Jamón has simply never been widely acclaimed or demanded outside of Spain (say as in hamburgers, pizza, sushi, or Coca-Cola). A few months ago in an attempt to solve the mystery behind why there are so many legs of ham everywhere in Spain and yet there are so few visible pigs, I revealed what may be a massive Jamón Conspiracy (see also, Parts II and III). And Last night while driving around in circles looking for parking with my friends Cobra and Berga, I discovered that there just might be a fourth explanation. Everytime I go into a bar or a supermarket, and I see severed, cured pig legs, I start doing the math. For every 4 legs (two paletillas and two jamones), you are missing one big pig. And as Cobra, Berga, and I were driving around, we kept passing small bars that were packed like sardines with legs of ham hanging everywhere. Then, it finally occurred to me why there were so many pig legs and yet no pigs in sight. If they didn’t cut off the legs and just left the entire pig, then there wouldn’t be any room in these tiny bars for all of the customers. Of course, that’s why they cut the legs off. They desperately need the space. It’s a resource issue. Just imagine going into a bar for tapas and it is full of huge Iberian pigs hanging from the ceiling. The only solution they could reasonably come up with was to discard everything but the front and hind legs. Sacrifice the bodies for greater leg room. Nevertheless, this doesn’t explain where the rest of the pig is hiding. The saga, the mystery, that conspiracy behind the conspiracy continues. Finally, Spanish jamón is available in the US. This means more jamón legs, but still no one has yet to explain where the pigs are coming from. For background information, please read Jamón: What nobody wants to admit and Jamón part II: an alternative version. Does this mean more clandestine pig hospitals? More genetic engineering of mutant pigs capable of regenerating their legs? Will Dustin Hoffman be starring in the lead role of the sci-fi thriller? On June 9th, I wrote “Jamón: What nobody wants to admit” about the dark side of Spain’s devotion for its beloved cured pig legs. Allow me to clarify: I am not a huge fan of conspiracy theories, but I do believe that Spanish people bare a hidden secret that they conceal from foreigners like me. As a matter of fact, each time that I bring up the subject in the office, everyone gets very uncomfortable and suspiciously defensive. My theory is that at a young age, children are told by their parents the truth under sworn oath (they are probably even forced to sign an NDA) about how there can be such a vast number of pig legs with so very few pigs. Basically, I have arrived at two possibilities: (i) massive, clandestine imports or (ii) genetically engineered pigs that can regenerate their legs after they have been cut off (yes, sounds like a sci-fi horror movie starring aged and washed up actors). 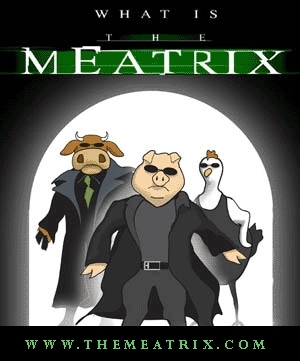 In any event, my brother, very much the conspiracy theorist, has offered another possibility: The Meatrix. My guess is that he would plea to “fight the power”.